Can you believe that the first High School Football Practices are now less than three weeks away in Prescott? 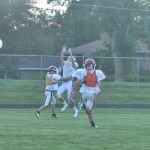 The Cardinals will open practice on August 1st, and the Hastings Raiders will follow on August 13th. KDWA’s Nick Tuckner has a look at what both teams will be up to through the first few weeks.